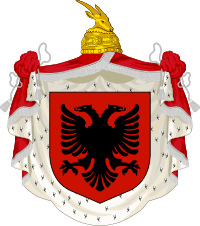 The House of Zogu is an Albanian dynasty founded in the late 15th century. The family provided the short-lived modern Kingdom of Albania with its only monarch, Zog of Albania (1928-1939). The dynasty was founded by Zogu Pasha who migrated to Mati, Albania in the late 15th century and was then appointed Governor of Mati by the Ottoman Sultan, with the position of Governor then becoming hereditary among the Zogu clan. The ancestral home of the Zogus was Castle Burgajet. The most famous member of the dynasty is Zog I, Skanderbeg III, who in 1928 was proclaimed King of the Albanians and ruled until he was deposed by Victor Emmanuel III of Italy and the Italian invasion in 1939. Victor Emmanuel subsequently assumed the Albanian throne. King Zog's son was Leka, Crown Prince of Albania, known as King Leka I. ↑ Niget, Florian (5 December 2012). "Chantilly : à 79 ans, il peut devenir roi d'Albanie". Le Parisien. Retrieved 19 December 2012.